The designs run the gamut from simple decorations to quite intricate work but they’re all terrific ideas that would please a gamer. The creativity is amazing. Does your guy reside in the Minecraft world part-time? A Minecraft boy’s birthday party might be in your future. 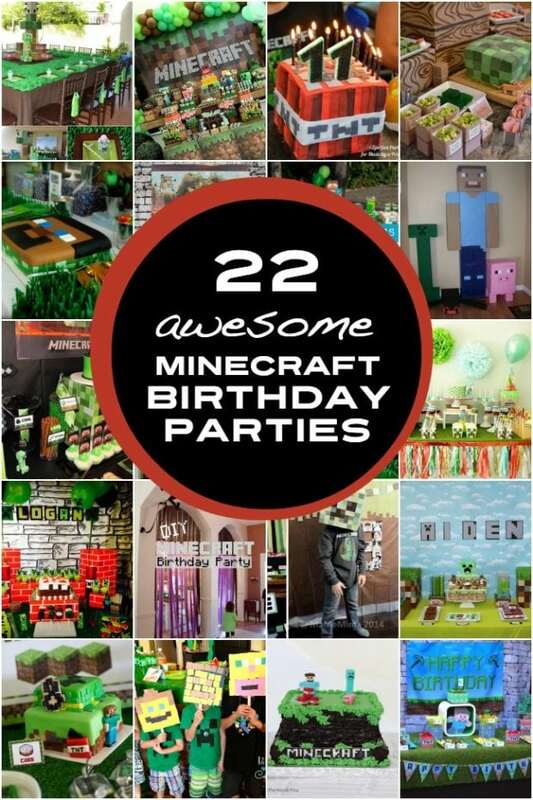 See Also: You’ll want to check out these 17 Minecraft Party Supplies We Love. Everyone equates the Creeper with Minecraft! What better choice for a Minecraft birthday party than a Creeper cake? This Minecraft Creeper cake even features the well-known pixelated look. Squares of fondant are pieced together on a square cake and definitely achieve the classic Creeper face look. Unless you love decorating cakes and are quite talented at cake construction and design, leave this Minecraft cake for an expert. Making the Minecraft pig and watermelon is definitely a very detailed and complicated process that requires many steps, carving the cake, building the levels, adding ganache, piecing fondant, and even using edible spray paint. A red and black square TNT cake that used a sparkler instead of a candle must have been a good dose of excitement for the birthday boy. It’s the perfect choice for a Minecraft birthday party. The fondant details are impressive. This carrot cake is a fun take on a Minecraft birthday cake. It features two varying light green shades of buttercream “bots” to give a pixelated feel. Doesn’t it look delicious? Steve is nearby on guard duty. Guests at your Minecraft birthday party will go crazy over this triple layer cake! It features three different layers in shades of red, yellow, and green that pay tribute to different elements of the Minecraft game. 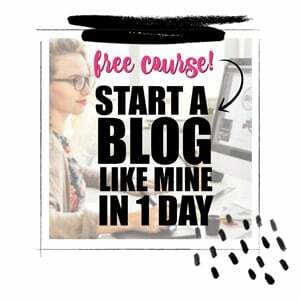 Instantly guests will recognize the TNT top layer and the Creeper inspired bottom layer. The pixelated look to the fondant is a really awesome detail. 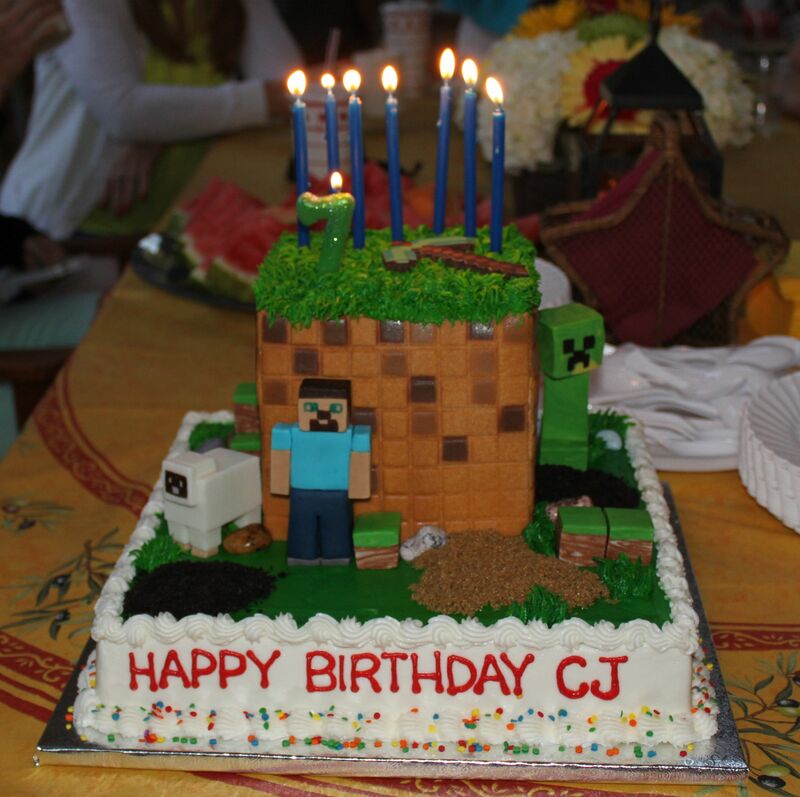 Check out this blog for three different, really nice interpretations of Minecraft cakes. When it comes to designing a Minecraft birthday cake, think square! This large square cake is a great example. A chocolate brown cake is mostly exposed (looks like dirt), but a layer of green frosting grass covers the top to resemble the game. Fondant figurines of Steve, the Creeper, a pig, and TNT embellish the top of the Minecraft cake. With the square, pixelated details playing such a role in the Minecraft world, this Minecraft birthday cake idea is brilliant! Instead of the typical round cupcakes, why not serve square-shaped, mini personal chocolate cakes topped in green fondant with a variety of bot patterns? No cake cutting during the party is required! Would you believe that this square Minecraft game cake and coordinating square cupcakes are constructed of 1850 squares held together with syrup? Impressive…and time consuming. The finished look is pretty cool. Have you ever had a square cupcake before? What a clever touch for a Minecraft birthday! A standing hero Brine Minecraft cake is an amazing addition to a Minecraft birthday party refreshment table. This confection is done in square shapes of course, in shades of blue and flesh tones. His eyes even look like they glow. Do you see his Minecraft buddies standing nearby? 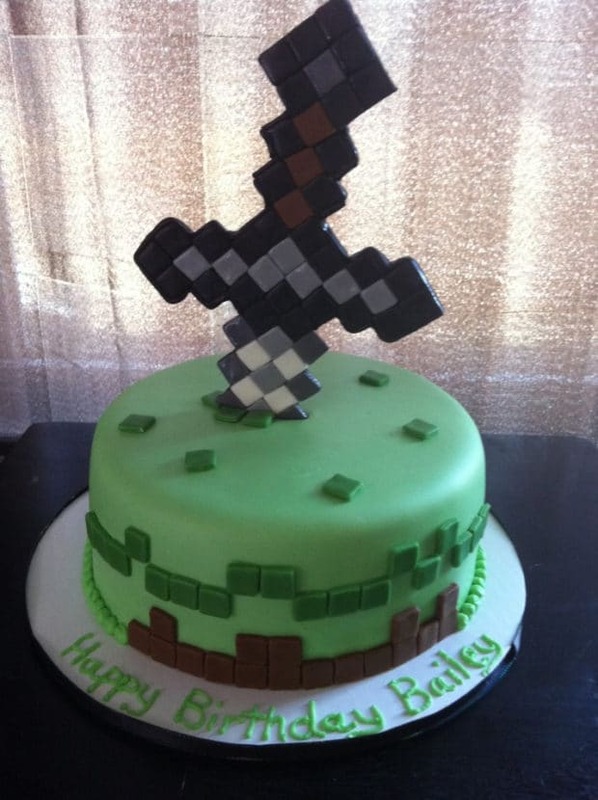 A lot of skill and patience is needed to make this Minecraft cake. Kids might explode with enthusiasm when they see this Minecraft birthday party TNT cake. 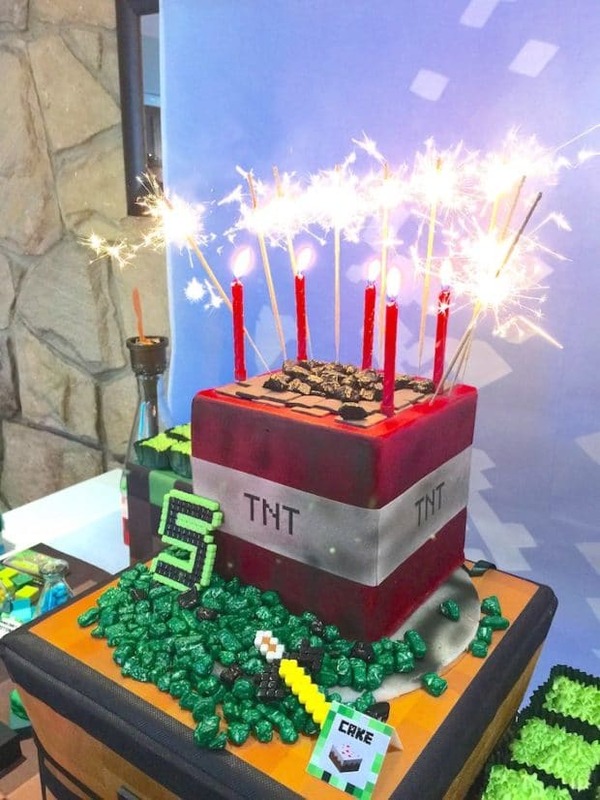 Layers of square shaped cake are covered in red, white, and gray fondant to create the instantly recognizable TNT boxes from the game. Make the birthday candle your fuse and ignite the birthday chorus. Transform a rectangular sheet cake into a Minecraft birthday cake by covering it in green frosting “grass”. Use Minecraft Legos to dress it up. Don’t Lego Steve and the Lego Creeper look cool? Sometimes simple is the only way to go when it comes to cake. While many Minecraft cakes feature squares of fondant, this cake does not. The birthday cake featured here is a simple round cake decorated in green frosting. Cupcakes displayed on lower tiers feature printable pixelated Minecraft toppers as a festive birthday embellishment. Making fondant that tastes good and looks great isn’t everyone’s cup of tea. This awesome Minecraft cake utilizes homemade fondant. 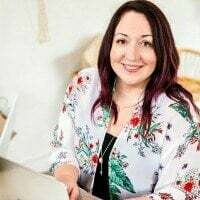 Thankfully, this baking Diva shares how she made the white fondant with red squares over the cake block – and she makes it sound easy. Serve up this Minecraft cake at your next Minecraft birthday party. Everyone’s favorite pixelated game is now represented in cake form. This Minecraft birthday cake definitely features the well-known square shapes, shades of green and brown with a small TNT on top. The fondant work is fantastic. There are so many versions of Minecraft cakes, each with their own distinct details. This version has a lot to look at. The major Minecraft components are all here, but the cake does not look cluttered. Can you spot your favorite pixelated characters created in cake and fondant form? Tissue Grass Mats<- perfect for putting under cakes and cupcakes!